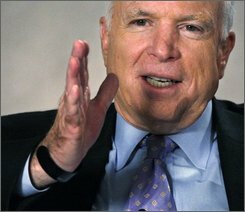 WASHINGTON (AP) — Whenever the presidential campaign trail gets to John McCain, all he has to do is look down at his wrist. McCain said he has been wearing a bracelet in memory of Cpl. Matthew Stanley ever since Stanley's mother gave it to him two months ago while he was campaigning in New Hampshire. The 22-year-old soldier was killed last year in Iraq. The Republican senator from Arizona was wearing the black bracelet [from InOurHearts.org] during an interview Tuesday with reporters and editors of The Associated Press. He said he promised Stanley's mother, Lynn Savage of Wolfeboro, N.H., that he will do everything in his power to make sure her son's death was not in vain. "It means any political ambitions of mine pale in comparison to the sacrifice that nearly 4,000 family members have made," McCain said of the bracelet. He said although political pundits say his determination not to end the fight in Iraq will kill his political career, "when you meet the mother of Matthew Stanley, then what difference does that make?"